Yellowstone National Park has started using porous, or thirsty, concrete in walkways throughout the park. The new concrete, called Flexi-Pave, is made with stones and recycled tires, and Michelin has been helping install it all over the park. 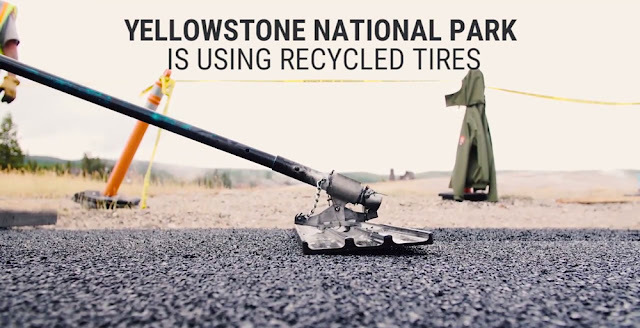 Forest rangers who work at the park have even donated their used tires to the project. Flexi-Pave is a pour-in-place, rubber paving surface that is impervious to storm water. The rubber used to make Flexi-Pave comes from recycled tires. It's similar to porous pavement but has the advantage of a flexible surface that doesn't crack or develop potholes. It's been used for sidewalks, parking lots and roadways. The cost is approximately $6 per square foot installed. Yellowstone will replace 4,160 feet of walkways throughout the park. It can absorb about 3,000 gallons of water an hour per square foot.